The Mauna Kea Observatories (MKO) are a number of independent astronomical research facilities and large telescope observatories that are located at the summit of Mauna Kea on the Big Island of Hawaiʻi, United States. The facilities are located in a 525-acre (212 ha) special land use zone known as the "Astronomy Precinct", which is located within the 11,228-acre (4,544 ha) Mauna Kea Science Reserve. The Astronomy Precinct was established in 1967 and is located on land protected by the Historical Preservation Act for its significance to Hawaiian culture. The location is near ideal because of its dark skies from lack of light pollution, good astronomical seeing, low humidity, high elevation of 4,205 meters (13,796 ft), position above most of the water vapor in the atmosphere, clean air, good weather and low latitude location. After studying photos for NASA's Apollo program that contained greater detail than any ground-based telescope, Gerard Kuiper began seeking an arid site for infrared studies. While he first began looking in Chile, he also made the decision to perform tests in the Hawaiian Islands. Tests on Maui's Haleakalā were promising, but the mountain was too low in the inversion layer and often covered by clouds. On the "Big Island" of Hawaiʻi, Mauna Kea is considered the highest island mountain in the world. While the summit is often covered with snow, the air is extremely dry. Kuiper began looking into the possibility of an observatory on Mauna Kea. After testing, he discovered the low humidity was perfect for infrared signals. He persuaded Hawaiʻi Governor John A. Burns to bulldoze a dirt road to the summit where he built a small telescope on Puʻu Poliʻahu, a cinder cone peak. The peak was the second highest on the mountain with the highest peak being holy ground, so Kuiper avoided it. :25 Next, Kuiper tried enlisting NASA to fund a larger facility with a large telescope, housing and other needed structures. NASA, in turn decided to make the project open to competition. Professor of physics, John Jefferies of the University of Hawaii placed a bid on behalf of the university. Jefferies had gained his reputation through observations at Sacramento Peak Observatory. The proposal was for a two-meter telescope to serve both the needs of NASA and the university. While large telescopes are not ordinarily awarded to universities without well-established astronomers, Jefferies and UH were awarded the NASA contract, infuriating Kuiper, who felt that "his mountain" had been "stolen" from him. Kuiper would abandon his site (the very first telescope on Mauna Kea) over the competition and begin work in Arizona on a different NASA project. After considerable testing by Jefferies' team, the best locations were determined to be near the summit at the top of the cinder cones. Testing also determined Mauna Kea to be superb for nighttime viewing due to many factors, including the thin air, constant trade winds and being surrounded by sea. Jefferies would build a 2.24 meter telescope with the State of Hawaiʻi agreeing to build a reliable, all weather roadway to the summit. Building began in 1967 and first light was seen in 1970. Other groups began requesting subleases on the newly accessible mountaintop. By 1970, two 24 in (0.6 m) telescopes had been constructed by the United States Air Force and Lowell Observatory. In 1973, Canada and France agreed to build the 3.6 m CFHT on Mauna Kea. However, local organizations started to raise concerns about the environmental impact of the observatory. This led the Department of Land and Natural Resources to prepare an initial management plan, drafted in 1977 and supplemented in 1980. In January 1982, the University of Hawaiʻi Board of Regents approved a plan to support the continued development of scientific facilities at the site. In 1998, 2,033 acres (823 ha) were transferred from the observatory lease to supplement the Mauna Kea Ice Age Reserve. The 1982 plan was replaced in 2000 by an extension designed to serve until 2020: it instituted an Office of Mauna Kea Management, designated 525 acres (212 ha) for astronomy, and shifted the remaining 10,763 acres (4,356 ha) to "natural and cultural preservation". This plan was further revised to address concern expressed in the Hawaiian community that a lack of respect was being shown toward the cultural values of the mountain. As of 2012[update], the Mauna Kea Science Reserve has 13 observation facilities, each funded by as many as 11 countries. It is one of the world's premier observatories for optical, infrared, and submillimeter astronomy, and in 2009 was the largest measured by light gathering power. There are nine telescopes working in the visible and infrared spectrum, three in the submillimeter spectrum, and one in the radio spectrum, with mirrors or dishes ranging from 0.9 to 25 m (3 to 82 ft). In comparison, the Hubble Space Telescope has a 2.4 m (7.9 ft) mirror, similar in size to the UH88, now the second smallest telescope on the mountain. Planned new telescopes, including the Thirty Meter Telescope, have attracted controversy due to their potential cultural and ecological impact. The multi-telescope "outrigger" extension to the Keck telescopes, which required new sites, was eventually canceled. Three or four of the mountain's 13 existing telescopes must be dismantled over the next decade with the TMT proposal to be the last area on Mauna Kea on which any telescope would ever be built. The Reserve was established in 1968, and is leased by the State of Hawaiʻi's Department of Land and Natural Resources (DLNR). The University of Hawaiʻi manages the site and leases land to several multi-national facilities, which have invested more than $2 billion in science and technology. The lease expires in 2033 and after that 40 of 45 square kilometers (25 of 28 square miles) revert to the state of Hawaii. The altitude and isolation in the middle of the Pacific Ocean makes Mauna Kea one of the best locations on earth for ground-based astronomy. It is an ideal location for submillimeter, infrared and optical observations. The seeing statistics show that Mauna Kea is the best site in terms of optical and infrared image quality; for example, the CFHT site has a median seeing of 0.43 arcseconds. Accommodations for research astronomers are located at the Onizuka Center for International Astronomy (often called Hale Pōhaku), 7 miles (11 km) by unpaved steep road from the summit at 9,300 feet (2,800 m) above sea level. An adjacent visitor information station is located at 9,200 feet (2,800 m). The summit of Mauna Kea is so high that tourists are advised to stop at the visitor station for at least 30 minutes to acclimate to atmospheric conditions before continuing to the summit, and scientists often stay at Hale Pōhaku for eight hours or more before spending a full night at observatories on the summit, with some telescopes requiring observers to spend one full night at Hale Pōhaku before working at the summit. The Submillimeter Array of radio telescopes at night, lit by flash. Telescopes found at the summit of Mauna Kea are funded by government agencies of various nations. The University of Hawaiʻi directly administers two telescopes. In total, there are twelve facilities housing thirteen telescopes at or around the summit of Mauna Kea. It may also be the site of the Thirty Meter Telescope and is a proposed site for Pan-STARRS. CSO, UKIRT, and UH88 are scheduled for decommissioning as part of the Mauna Kea Comprehensive Management Plan. The Audubon Society objected to further development on Mauna Kea over concerns to habitat of the endangered Palila, a species endemic to only specific parts of this mountain. The bird is the last of the finch billed honeycreepers existing on the island. Over 50% of native bird species had been killed off due to loss of habitat from early western settlers or the introduction of non-native species competing for resources. Hunters and sportsmen were concerned that the hunting of feral animals would be affected by the telescope operations. A "Save Mauna Kea" movement was inspired by the proliferation of telescopes, with opposition believing development of the mountain to be sacrilegious. Native Hawaiian non-profit groups, such as Kahea, whose goals are the protection of cultural heritage and the environment, oppose development on Mauna Kea as a sacred space to the Hawaiian religion. 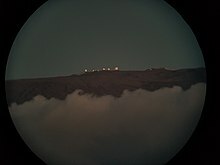 Today, Mauna Kea hosts the world's largest location for telescope observations in infrared and submillimeter astronomy. The land is protected by the United States Historical Preservation Act due to its significance to Hawaiian culture, but still allowed development. A number of the telescopes sustained minor damage during the October 15, 2006 Kiholo Bay earthquake and aftershocks. JCMT was performing an inclinometry run and recorded the earthquake on its tilt sensors. Both CFHT and W. M. Keck Observatory were operational and back online by October 19. ^ a b "The Economic Impact of Astronomy in Hawai'i" (PDF). University of Hawaii Economic Research Organization. 28 August 2014. Retrieved 14 July 2015. ^ a b c d e f g J. B. Zirker (18 October 2005). An Acre of Glass: A History and Forecast of the Telescope. JHU Press. pp. 89–95. ISBN 978-0-8018-8234-0. ^ Educational Foundation for Nuclear Science, Inc. (November 1964). Bulletin of the Atomic Scientists. Educational Foundation for Nuclear Science, Inc. p. 35. ISSN 0096-3402. ^ David Yount (1 January 1996). Who Runs the University? : The Politics of Higher Education in Hawaii, 1985-1992. University of Hawaii Press. p. 232. ISBN 978-0-8248-1821-0. ^ Astronomy Now. Intra Press. 1991. p. 45. ^ a b Barry R. PARKER (11 November 2013). Stairway to the Stars: The Story of the World’s Largest Observatory. Springer. ISBN 978-1-4899-6052-8. ^ David Leverington (6 December 2012). A History of Astronomy: from 1890 to the Present. Springer Science & Business Media. p. 276. ISBN 978-1-4471-2124-4. ^ Robert M. Kamins; Robert E. Potter; University of Hawaii (System) (January 1998). Måalamalama: A History of the University of Hawaiʻi. University of Hawaii Press. pp. 210–211. ISBN 978-0-8248-2006-0. ^ Joseph N. Tatarewicz (1990). Space Technology & Planetary Astronomy. Indiana University Press. p. 82. ISBN 0-253-35655-5. ^ Pickles, Andrew (2003). "Timeline of Astronomy in Hawaiʻi". Mauna Kea Observatories Outreach Committee. Archived from the original on July 27, 2011. Retrieved October 2, 2010. ^ a b Institute for Astronomy – University of Hawaii (January 2009). "Mauna Kea Comprehensive Management Plan: UH Management Areas". Hawai`i State Department of Land and Natural Resources. Archived from the original (PDF) on March 4, 2016. Retrieved August 19, 2010. ^ "Mauna Kea Science Reserve Astronomy Development Plan 2000–2020 – Summary" (PDF). Institute for Astronomy – University of Hawaii. August 1999. Archived from the original (PDF) on August 21, 2010. Retrieved August 19, 2010. ^ "Thirty Meter Telescope Selects Mauna Kea". Press release. California Institute of Technology, University of California, and the Association of Canadian Universities for Research in Astronomy. August 21, 2009. Archived from the original on August 10, 2010. Retrieved August 29, 2010. ^ a b "History". Office of Mauna Kea Management. Retrieved February 2, 2015. ^ "Mauna Kea Observatories". Maunakea Telescopes. University of Hawaii Institute of Astronomy. Retrieved 3 December 2015. ^ "Third Maunakea observatory set for decommissioning". University of Hawaii News. University of Hawaii. Retrieved 3 December 2015. ^ Terry D. Oswalt (2003). The Future of Small Telescopes in the New Millennium. Springer Science & Business Media. p. 18. ISBN 978-94-010-0253-0. ^ Michael Dear; Jim Ketchum; Sarah Luria; Doug Richardson (13 April 2011). GeoHumanities: Art, History, Text at the Edge of Place. Routledge. p. 476. ISBN 978-1-136-88347-7. ^ Mark Gordon (18 July 2007). Recollections of "Tucson Operations": The Millimeter-Wave Observatory of the National Radio Astronomy Observatory. Springer Science & Business Media. pp. 136–140. ISBN 978-1-4020-3236-3. ^ Robert F. Oaks (1 November 2003). Hawaii:: A History of the Big Island. Arcadia Publishing. p. 131. ISBN 978-1-4396-1403-7. ^ Ned Kaufman (11 September 2009). Place, Race, and Story: Essays on the Past and Future of Historic Preservation. Routledge. p. 14. ISBN 978-1-135-88972-2. ^ Judith Schachter (15 September 2013). The Legacies of a Hawaiian Generation: From Territorial Subject to American Citizen. Berghahn Books. p. 43. ISBN 978-1-78238-012-2. ^ Davis, Gary (2007). "News from the JCMT". Canadian Astronomical Society. Retrieved 14 July 2015. ^ "2006 October 15 Earthquake Aftermath at CFHT". Canada–France–Hawaiʻi Telescope. January 11, 2007. Retrieved August 27, 2010. ^ "Earthquake Update from W. M. Keck Observatory". W. M. Keck Observatory. Retrieved August 27, 2010. 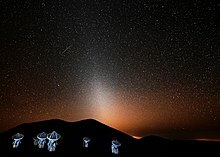 Wikimedia Commons has media related to Mauna Kea Observatories.